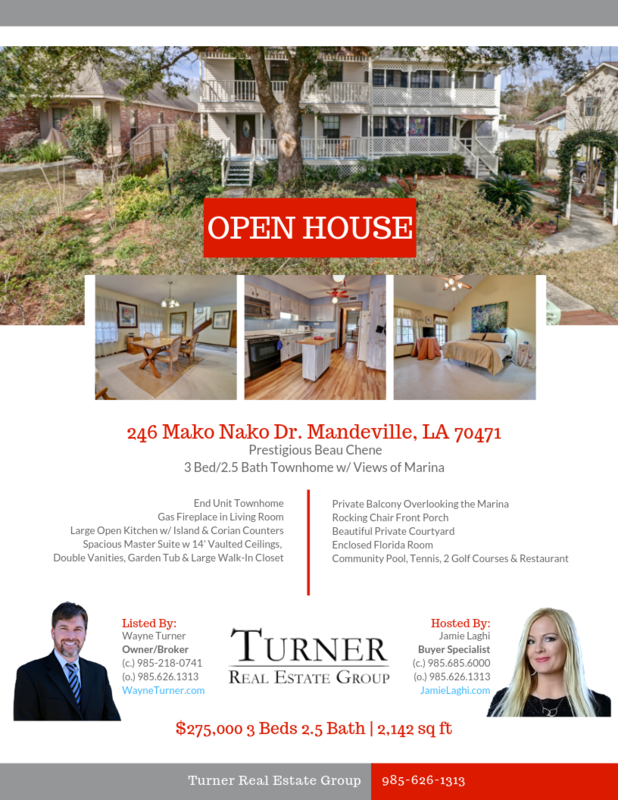 Turner Real Estate Group is hosting an open house this Sunday, March 31, 2019 from 2-4 p.m. in Beau Chene subdivision in Mandeville. The featured property is 246 Mako Nako Dr. This end unit townhome has beautiful views of the marina from the front porch. The living room has a gas fireplace, and the kitchen has an island with solid corian tops. You’ll love the soaring ceilings in the master bedroom, as well as the garden tub, double vanities and large walk in closet. There’s also a garage, private courtyard, and balcony overlooking marina. Beau Chene has a community pool, tennis, golf courses, and a restaurant. Experience all it has to offer!